As a transgender person, Jaisy* is used to harassment but the time she spent in prison in Kerala, India stands out due to the physical and verbal abuse she was forced to endure. In July 2015, Jaisy was invited to share her experiences at a state-level workshop to sensitize law enforcement agencies on issues affecting transgender people in Kerala. The workshop was convened by the Voluntary Health Services (VHS), in partnership with the Kerala State AIDS Control Society (KSACS) and in coordination with Dale View (a local health organization). VHS has been organizing sensitization programmes with law enforcement agencies in Kerala with support from UNDP through the Multi-Country South Asia Global Fund HIV Programme. 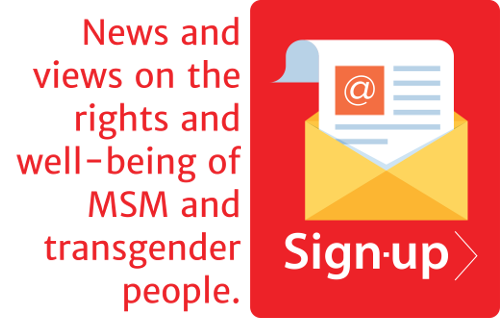 These sensitization programmes target policy makers and aim to achieve societal acceptance of transgender people, reduce stigma and discrimination, and improve access to services including health care. Estimates put the transgender population in Kerala at more than 25,000. Jaisy’s impassioned plea at the workshop contributed to the Director General of Police (Prisons), Mr. Loknath Behera developing a new state-level policy of dedicated cell blocks for prisons for transgender people. The policy, which is a first for the country, was announced in October 2015. It will initially be launched at six new prison buildings and will translate into greater safety and security for transgender prisoners. Prior to October 2015, there had never been a policy that provided separate cells for transgender people in India. As a result, transgender people were placed according to their birth-assigned gender, rather than their preferred gender identity regardless of their current appearance. Confined to cells with limited privacy and protection, they are vulnerable to harassment, discrimination, physical and sexual assault, and other threats to their health and well-being. Director General Behera, who gave the inauguration address at the July workshop, noted that previously he was not at all enlightened about transgender issues. However, the discussions had given him structured knowledge about transgender people in society and provided insight to push for progress for the betterment of the transgender community. Other speakers at the workshop included Sri Loknath Behera IPS, the Director General of Police (Prisons), Sri. S. Sreejith IPS, the Commissioner for State Human Rights Commission, Sri. H. Venkatesh IPS, the City Police Commissioner for Thiruvananthapuram, Mr. Anil Kumar Pillai, an Advocate of Kerala High Court, Ms. K.G. Sreedevi from the Department of Social Justice, and Ms. Surya, a transgender television celebrity. Sensitizing law enforcement agencies is only one part of VHS’ overall efforts, which also includes working with the media and government departments to advocate for policy change, to improve the well-being of transgender people. The new prison policy is part of a wave of firsts for Kerala, including the new state-wide Transgender Policy launched in November 2015, and the new Gender-Taxis, a taxi service operated by transgender people.